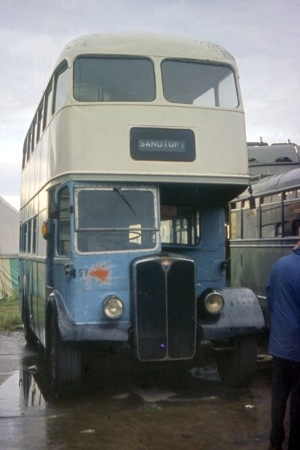 Here we have a picture I took at Sandtoft around 1972/3. This bus started life in 1950 with Hanson of Huddersfield as an AEC Regal III 9621E with a Duple C33F body, registration EVH 805 fleet number 295. 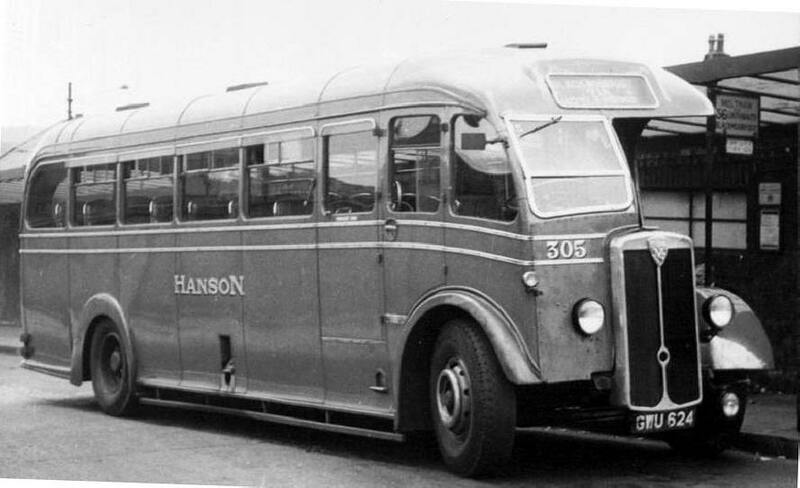 To ‘modernise it’ in 1954 Hanson had Plaxton remove the front bulkhead and build a Venturer style full front on it. It was then renumbered 326. In 1961 Hansons’ rebuilt the chassis and had a new Roe H37/28F body fitted, re-registered it as TVH 497 and gave it fleet number of 361. Numerically it was the seventh rebuild in the series, the fourth double decker and the first front entrance decker. It passed to Huddersfield Corporation with the stage carriage operations of Hansons’ on 1st October 1969. Thornes of Bubwith acquired it in October 1970 as their no. 57. Although listed as being withdrawn and scrapped in Thornes own lists in May 1972, it was eventually acquired for preservation. It is seen in the above colour shot in as acquired condition and what appears to be ex Aachen 22, a 1956 Henschell trolleybus with Ludewig body along side it. As this trolleybus is kept at the Sandtoft Transport Centre one must assume 361’s destination blind is telling the truth! I’m afraid I didn’t keep records of the pictures I took in those days so have to rely on detective work to place and date them. Sadly 361’s career as a preserved bus didn’t last very long, I believe it suffered a catastrophic engine failure and was sold for scrap. Thanks for posting. I have in my "bought" collection a view of VVH 348 which, by that time, had migrated to the Porthcawl Omnibus Company. Pete, That would be 368 when with Hanson, rebuilt in 1962 from 1949 Roe H31/25R bodied Regent III 285, ECX 414. Unfortunately I don’t believe 361 suffered any catastrophic failure at all, but was just sold. It was kept here where I live in Greenfield, less than five minutes walk from where I now live, along with various other vehicles including my own. It just disappeared one day and I was annoyed about it at the time and even more so now, as it is a genuine Saddleworth bus which would have appeared frequently on the Oldham service which ran past Greenfield station. The shame is that, had it survived at Thorne’s, even out of use, a bit longer it might have joined their fleet of splendidly-restored vehicles. I was always under the impression that a conrod came through the engine block and that is why it was scrapped. It did get repainted in an approximation of Hanson livery but the shade of red was far too dark, almost maroon. There are some photos about of it in these colours. The correct shade was a Dulux colour called Wexham Red. I did know the owner at one time but it is many, many years since I lost contact with him. I bought 361 from Thornes and moved it initially to Sandtoft. It was then subsequently moved to Huddersfield goods yard where it was repainted into Wexham Red. The bus subsequently moved to a mill yard in Greenfield where it received the engine from Morecambe 57. 361 attended some rallies in the mid seventies and visited Shildon for the anniversary in 1975 (?). The bus was sold in serviceable condition when I got married in 1976. This bus was originally a 1938 AEC Regal coach registration ACX903 fleet number 113 and it had a Plaxton C32F body. It was then rebodied by Duple in 1949 to a front entrance bus with 35 seats and renumbered 284. In 1956 the Duple Body was transferred to an ex Bottomleys Motors 1946 Maudslay Marathon lll chassis and numbered 305 with Hanson, a photo of which is here. The chassis was then rebodied by C.H. 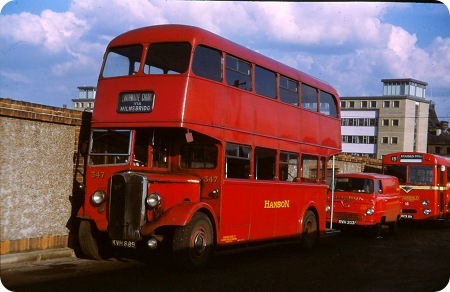 Roe and numbered 347 with a registration of KVH 889 and classed as a AEC/Hanson Regent H37/28R. On every picture I have seen of this bus the engine side panel is not fitting correctly, I wonder if it ever did. My thanks go to the Hanson section of the website belonging to Huddersfield Passenger Transport Group for all the information. Maybe the ill-fitting bonnet cover was caused by chassis sag, especially as it was a double-deck AEC Regal! The unrelieved red does the vehicle no favours. The chassis of 347 was actually built up from components of two pre-war Regal chassis, 113 as stated above and ex Chapman’s Regal Burlingham coach VH 9101 of 1936 which was withdrawn in 1954 after an accident. It was the first of twenty two AEC’s to get rebuilt by Hanson’s over the next ten years and was the only one, apart from fire victim 1964 Reliance rebuild 384, not to pass to Huddersfield Corporation in 1969. 347 is far from being unique for pre war style AEC’s running with the bonnet side hanging off. For example, there are several photos around of Tom Burrows, Barnsley, very similar bodied Regents with the same problem. I’m sure I’ve seen a picture of one of Burrows Regents even running with an ex STL bonnet side in the same position. Even though it is forty six years since 347 was scrapped, and it was well passed it’s sell by date by then, I have fond memories of riding on it and listening to that melodious prewar manual gearbox. Extant pictures of SUT Regals approaching (or beyond) withdrawal also show the dropped panel effect. Why? That I can’t say. These complex rebuilds are indeed really fascinating. 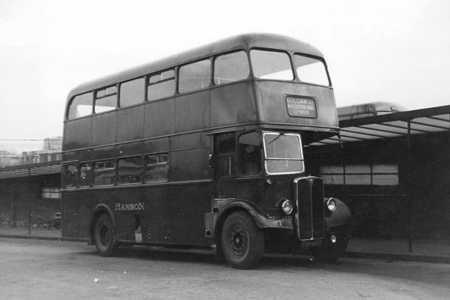 At Samuel Ledgard’s we had a magnificent (I loved it) AEC "Regal" coach with Burlingham body – I wonder how many of its merry passengers knew that it was a Birmingham Corporation 1930 Regent 1 double decker !! As Eric says about the Hanson vehicle, its powerful engine and wonderful gearbox, perfectly serviceable but delightfully worn to a lovely tune, were a joy. Incredibly, as it was definitely a "one off", it was the subject of a Corgi model – a good model if you can forgive the Duple body instead of Burlingham and the registration number incorrect – FWJ 938, should be FJW 938 – ah well, better than nothing I suppose. While I can’t recall seeing any ill-fitting bonnet sides like that shown, I can recall lots of London Transport’s veterans buses, in my childhood, which had unsecured bonnet sides propped up only by the nearside mudguard! Maybe this was to keep worn-out engines from over-heating! I always thought CVD6’s were meant to look like that!